On Easter Day, following the church service, Gerald and Jenafor Azure gave me an invitation that I could not possibly refuse. The appointment was set for Wednesday (yesterday), and I found myself really looking forward to it; hoping particularly that conditions would be right for an actual run on a sled! However, just as I was putting on my parka to walk over to their place, the rectory telephone rang. It was the kind of call that makes this vocation of mine a 24/7 kind of thing. Churchill, even though it is in Manitoba, provides primary medical services to the Nunavut territory – Canada’s northernmost region – and there is a residential building in town here where people from Nunavut can live while they or their family are getting treatment. After a few moments on the telephone, I knew that I would not be going out to meet the dog teams... at least, not right away. Gerald has to go out to his dogs regularly: to check on them, to feed them, and to ensure that everyone is alright (they are like family members; they all have names and personalities, and each one gets personal attention and affection from Gerald, who is definitely their “alpha dog”). If I could not be at his place at the agreed time, he would have to go out to the compound without me. You can imagine my relief at this kindness. My time spent at the Inuit centre was important, and I think helpful. I did the listening that needed to be done, and the prayer that needed to be prayed, and I made no attempt to rush away. When the person seemed to indicate that what was hoped for had been done, and when I agreed to come back every once in a while as long as they were here in Churchill, it was permissible to go. I called Jenafor to say that I was on my way. She was outside as I came up (the Churchill townsite is pretty small, and any part of it is, at most, ten minutes walk from anywhere else). She said, “I put some proper boots in the truck for you. Let me see your mitts.” “They’re just regular city gloves,” I said. She examined them and said, “They’ll do. It’s mild today.” And it was. While the skies were grey and overcast, the temperature was a very balmy -4°C, and there was almost no wind. “Get in the truck,” said Jenafor, “I’ll close up the house and we’ll be off!” So I got in, and was astonished to find two grown women crammed into the tiny jump seats behind me. One of them was Claudia, the PhD student from Austria (and relief organist at the church), who is living and working with the Azures as part of her studies. The other one I had not previously met. Melissa is a friend of Claudia’s, just visiting Churchill. Evidently, Melissa and I were each about to be honoured with a dog sled ride. Fabulous! A ride was going to happen! Churchill is at the intersection of three ecosystems: Arctic tundra, the boreal forest, and the maritime ecosystem of Hudson Bay. Our ten minute drive took us out of the tundra and into the boreal forest. The dog compound itself, when we got there, fascinated me. Each dog is kept on a six-foot chain. The chains allow the dogs to be near to one another, but there is no physical contact. If contact were permitted, constant dominance fights would be the order of the day. In the circle that is created by each chain there is a small rectangular doghouse with a stainless steel food bucket screwed onto one side. The roof of this little house is flat, and very often the dogs will sit, lie, or most commonly stand on the roofs of their houses. I suppose the compound can sometimes be quiet, with dogs standing or lying on their roofs keeping watch, or sprawled at the end of their chain in the snow, but when we pulled up, the twenty or so houses and chain-circles erupted with leaping and barking and baying. Round and round a dog would go, bounding up onto its house and down again, running to the end of its chain until it was yanked to a halt, and making a continuous racket. Although the dogs were big, powerful and full of teeth,1 this canine riot was not in the least bit scary to me. As far as I was concerned, it was pure exuberance. These dogs knew that something special was about to happen, and they wanted to be part of it. When it became clear that many of them were to be hitched to a sled, the noise grew deafening. Had they been able to speak English, every dog in the place would have been yelling, at the top of its lungs, “PICK ME! PICK ME! PICK ME! PLEASE PICK ME! I WANT TO GO! I CAN PULL A SLED! PICK ME! ME! ME! AOOOOOWWWOOOO!” In all my life I could never have imagined such an uproar. It was so extraordinary that I turned on my camera and recorded some of the commotion and din on video. If you would like to experience it, click here. 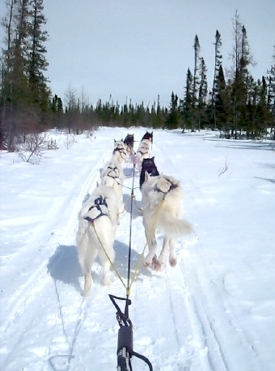 After an inaudible conference between Gerald and Claudia (who has been training as a musher), it was decided that two teams would go out, each pulling a sled. Gerald would lead, with me and Jenafor as his passengers, and Claudia would follow, with Melissa as hers. Then, while all around us the dogs were straining and yelling at the end of their chains, it was decided which dogs would go, and on whose team. Evidently a part of the afternoon’s exercise was to give the younger dogs some practice, and to pair them with more experienced dogs from whom they might be expected to learn something. There was considerable discussion, therefore, as to who would be paired with whom. Finally all was decided, and Gerald and Claudia began to pick out the elements of their teams. First, the lead dogs. Each is detached from its chain, and led – almost carried (all the while barking and yelping) – then clipped to a wire that has been fixed in a straight line along a fence. Then the second pair, and the third pair. Finally the “wheel” dogs – bigger and more powerful, whose place is nearest to where the tow line attaches to the sled, are clipped to the wire. I believe that this is a critical time in the preparation for the run; for if dogs who are expected to work beside one another begin to fight at this point, they may be removed from the team, or placed in a new position. Once everything looks good, and while the dogs are still clipped to the wire in their team positions, each is now fitted with a chest harness, to which the actual tow rope will be attached. Meanwhile, the two sleds are pulled into starting position, with tow rope stretched out in front. Once all the harnesses are on, the dogs are taken from the set-up wire and attached to the tow rope, beginning with the leads and working back to the “wheels.” The leads are not left loose, by the way. They are attached in some fashion to a stake, while all the others are put into team position behind them. “Particularly at the beginning, as we go through the gate of the yard, keep your hands inside the sled! When we go into the turns, lean like a motorcycle rider, to the inside of the turn. Hold on tight, until I say you can relax. “On the front seat, you may not stand up. We will stop partway along the trail, and if you would like to try standing, Jenafor will trade places with you, and you can be in the middle position, to stand or sit as you choose. The take-off was sudden and dramatic. Our sled careened through the gate, and there was good reason why Gerald said to keep my hands inside the sled. I could easly have lost a finger or two if we had bumped into the gatepost with the force and bounce of that launch! Almost at the very moment we tore away from the compound, the sun came out, and what had been a grey day was transformed. We raced into the boreal forest under a blazing blue sky, with brilliant white snow, and the deep dark green of the trees on either side. It was magical. No longer were the dogs barking and baying. They put their shoulders to the work and other than Gerald’s few calls of instruction and encouragement we slid through the forest in almost perfect silence. I reached for my camera. A moment later he shouted a word that wasn’t English and I don’t recall it. 2 At once, the lead dogs did a left turn and everything followed them with such speed and force that, had I been holding a camera in my hands, it would have flown off into the snow. “You can take it out now,” said Gerald, “We’ll be on a straight part for a while.” Indeed I could see the trail stretching ahead of us as far as the eye could see, following some hydro transmission lines. Out came my camera, and, as contented as could be, I took the first of several videos. The word “pup” certainly didn’t compute in my mind, since the dogs he identified as being six and seven months old were among the biggest on the team. I noticed differences in the gait of various dogs, and Gerald pointed out how the leg movement of experienced dogs differed from that of the beginners. He was particularly pleased with one of the newest, very young ones, because it had already learned the proper gait, and was pulling steadily and smoothly, with great economy of strength and motion. Meanwhile, Jenafor had offered to take some photographs with my camera – with me in them, naturally – and she and I now discussed how this might be accomplished. She said that there was a hill just past the halfway point of our six-mile journey. The dogs were going to be rested there, and while they were stopped, she would walk ahead down the trail and up the rise, and from there would likely be able to get a good video of us coming towards the camera. That would also be the point, when she was out of the sled, that I could begin my ride in the middle position. I really wanted to stand like a true musher, which was not possible in the front seat. So all this was agreed, and after our rest stop Jenafor got the best video of the afternoon. Now, as I have mentioned, I did some pastoral work at the Inuit centre just before going over to Gerald and Jenafor’s. Not only that, immediately following our supper together, I would have to be at the church to help lead a “Hymn Sing and Bible Study” session that happens weekly in this parish. 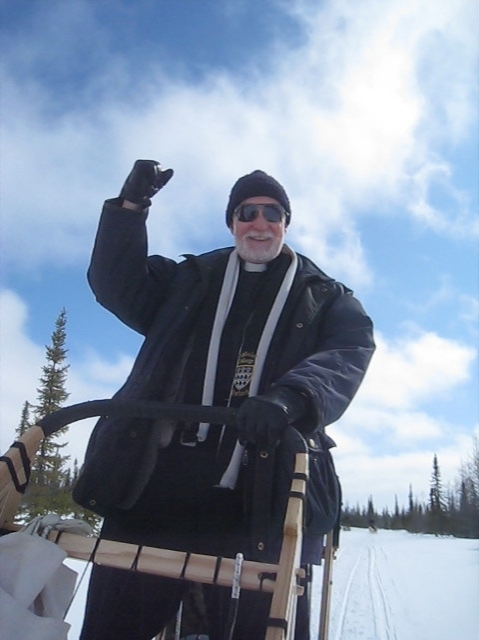 Consequently, I had come for my afternoon of dog sledding wearing my clergy shirt and collar. That resulted in the slightly incongruous but entertaining pictures that have recorded the day. The weather was mild enough that I could – and did – quite comfortably travel with my parka open and with the clergy collar highly visible. Photo captions such as “An Unusual Clergy House Call” kept running through my mind. And, truth be told, the whole thing was in many ways an utterly traditional home visit by a priest. Gerald and Jenafor are active in St. Paul’s congregation. I was visiting their home and workplace, and then being a guest at their table, as the parish priest. True, it didn’t involve me sitting in a suburban livingroom sipping tea, not by a long shot. But it was a genuine “clergy house call,” so why not have the photographic record tell it like it is!?? Jenafor caught some splendid images, both still and video, of me, of the dogs, and of Claudia and Melissa following behind us. Oh yes, and I loved the standing position. Memories of skiing as a child came back to me, and I flexed with the bumps and leaned with the turns and had the time of my life. The whole journey through the winter wilderness in brilliant light felt like we were in harmony with the natural world. But eventually, the trip had to come to an end. 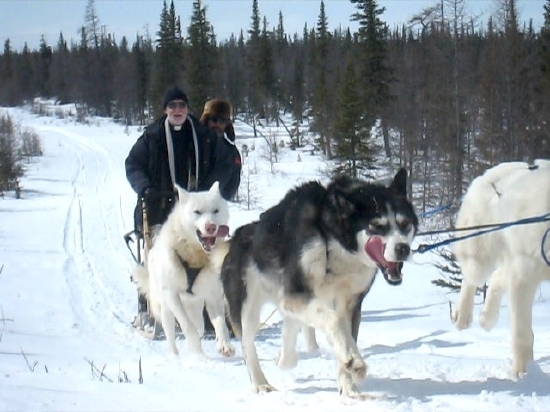 The two sleds pulled expertly into the yard, and the dogs were un-clipped and taken back to their respective chains and huts. Online dictionaries define the phrase, “a dog’s breakfast” as “a poor job, a mess.” 3 I now know why. What they served up to those excited critters made me gag. A grey mass of water, kibble, oatmeal, and raw chopped chicken. It was ladled out of huge tubs into each dog’s personal dinner-bucket, and as soon as it was slopped in, the dog set to work on it as if it was the finest sirloin. “Why so much water?” I asked. “For some reason, sled dogs will not drink water if you give it to them straight,” said Gerald. They’ll cool their tongues in snow; but drink? The dogs will have none of that thank you! So we have to mix plenty of water – which they need – in with their kibble. It forces them to drink sufficiently for good health. And with the growing background noise of slurping and schlopping, I knew that he was right. They were as excited about eating and drinking that disgusting mess as they had been for going out on a run. Could there be a better birthday present? When we got back to the Azure’s home, we all tucked into some bannock and moose stew that Jenafor had prepared – delicious human food. Joyce the “Cookie Lady” – another member of the church who lives right across the street – was invited over to join us, so we made a very fine party of it. And, when we finished our stew, they surprised me with a birthday cake and a birthday song. They knew that I am having a birthday this week, although they weren’t sure exactly which day. So they had made this day a birthday celebration for me. And I couldn’t have imagined a better birthday present... ever. Postscript: Some of the dogs who did not go out on today’s run, stayed behind because they are retired from sled work. 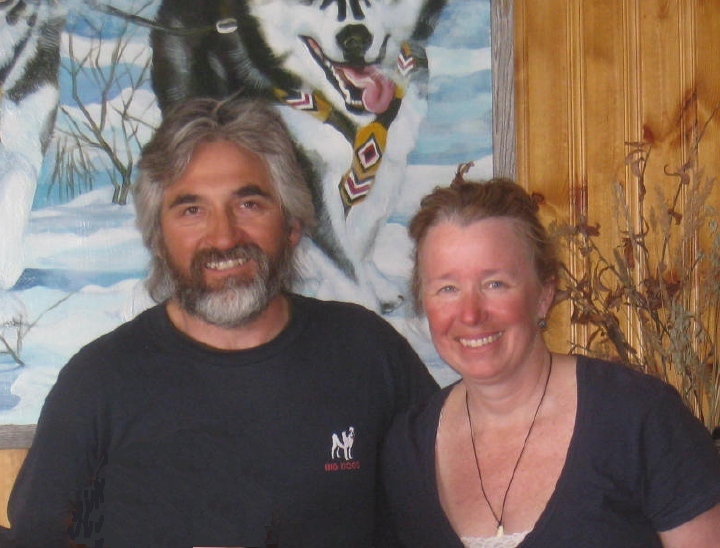 Although there are dog sled operations that euthanize dogs who can no longer pull a sled, Gerald tells me that he and Jenafor have chosen instead to adopt out their retirees. He says that such dogs can make very fine pets, and frequently live happily and usefully for many years in their new homes. There is more information here.